It may be on the “other” channel but we are loving this year’s I’m A Celebrity…Get Me Out Of Here. The reason this season is the best yet? Two words… Harry. Redknapp. The former Tottenham manager’s name was the most Googled topic in the UK on Sunday, with more than 200,000 searches. 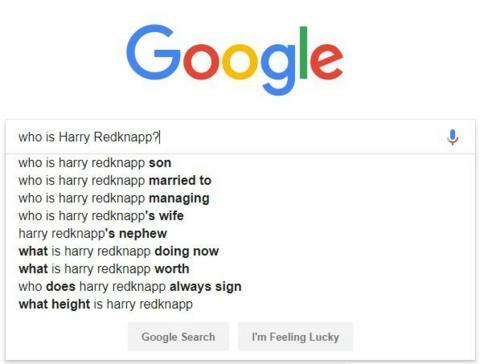 For millions of football fans, the “Redknapp dynasty” is nothing new, but for younger viewers of the ITV show, they may not have been as familiar with Harry before he went in the jungle. We wanted to answer a few of the most commonly asked Harry Redknapp-related questions. Ready for the quick biography? Here we go. Henry “Harry” James Redknapp was born in 1947 in the East End of London – not technically a “true cockney” but the accent is close enough. He began his footballing career as a Tottenham youth player, before making his professional debut for West Ham in 1965. Redknapp made 175 appearances for the Hammers in both league and cup games, scoring eight times over seven seasons. He went on to play for Bournemouth and US team Seattle Sounders before retiring in 1982, aged 35. We did say this would be a “quick biography” (and we don’t have all week) so here are the teams Redknapp managed and the years he was there. Redknapp led Portsmouth to FA Cup glory in 2008 and was named Premier League Manager of the Season in 2010 while in charge at Spurs. Who is Harry Redknapp’s son? He has two sons. The elder is Mark – a former model. The other, Jamie, is the one you’ve probably heard of, and inherited his Dad’s footballing genes. The now 45-year-old Jamie made his professional debut under his father’s guidance at Bournemouth in 1990. He went on to play for Liverpool, Tottenham, Southampton and was capped 17 times by England. Jamie recently posted this throwback picture of him and his father, saying “TBT to before he was the most famous storyteller in town”. Speaking of which, Harry’s stories have become a regular part of camplife in the jungle but he’s always been a great raconteur. If you have time, search the internet for his story about Tittyshev the Bulgarian striker. Who is Harry Redknapp married to? It’s fair to say Redknapp’s BEST stories involve his wife of 54 years, Sandra. Last week, Harry told his camp-mates the story of how the couple met during a dance at the ‘Two Puddings’ in the east end of London. “54 years later we are still going strong,” he told John Barrowman. “I almost love her too much,” he added. His mushy displays of affection have won the hearts of many over the past week – among them, many younger viewers who were quick to point out eligible chaps with Harry’s gentlemanly nature are few and far between these days. Who is Harry Redknapp managing? His most recent role was at Birmingham City in 2017, but he was sacked after five straight league defeats that left the team second bottom in the Championship table. After his sacking he suggested that there was “every chance” that he would not manage again, but is that still the case? Who is Harry Redknapp’s nephew? Former England and Chelsea star Frank Lampard is the son of Redknapp’s late sister-in-law Pat. “Uncle Harry” signed Lampard during his time at West Ham. Who does Harry Redknapp always sign? There are three players who often cropped up on a Redknapp team-sheet. Jermain Defoe, Peter Crouch and Niko Kranjcar each played under Redknapp three times. Is Harry Redknapp going to be the King Of the Jungle? OK, we admit this is probably not a regularly Googled question, but the answer is of course, “yes”.